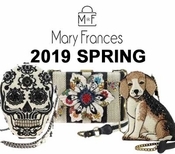 Fans of the Mary Frances collections are as varies as her handbags. These treasures are showing up on the arms of entertainers, artists, fashionistas, and renowned celebrities such as Oprah Winfrey, Kate Hudson, Jennifer Aniston... and the list goes on. Mary Frances' whimsical designs famed for their collaboration between fabric, texture, unique materials, and colors have fueled her soaring popularity. "Life's too short to not be inspired by your own look!!" Mary Frances exclaims with a big smile! Mary Frances' passion is to provide objects of artistic beauty at accessible prices. Each design is unique and as full of life as she is. 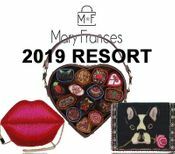 Mary Frances was acknowledged as "star of the show" during Paris fashion week for two consecutive years, and has received the prestigious Best Design award in Milan. Start your journey into Mary Frances by selecting a category below.